First time since 1971 officially swimmers in Potomac River. Not real swimmers though, triathlon swimmers. Nepalese Swimming Nationals start October 4th at Satdobato pool. 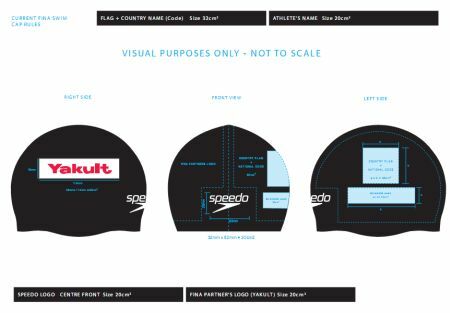 $117 a month for coaching, and $180 a year for registration and insurance to Swimming Australia and Swimming NSW. Bit much, eh? 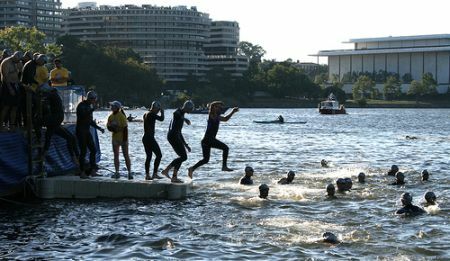 Jumping into the Potomac for the swim section of the first Nation’s Triathlon. Image by Blacknell. Penny Heyns is owner of two Olympic gold medals and broke world records fourteen times in her career that ended in 2001. She is now a motivational speaker and was just in Dubai to open new swimming club stamped with such a thought provoking name as Dubai Swim. Image of Penny Heyns from pamgolding.co.za. Hollandswimming has photos from the Italian training camp of Dutch national team swimmers. Swimmers seem to be everywhere, Janet Evans in People and Kathleen Hersey in Sports Illustrated. Scott ask himself and his two readers “What Does a Place on the USA Swimming National Team Get You?” Lemme guess, not much? I have a dream, or actually Thomas Jansson has a dream and Padersson just throwns in his grain of salts. Insweep got some Spanish national teams listed, bit less people than in the US ones. A mockumentary about the first male synchronized swimming team at UQ, as they go head to head with the infamous International Swedish Team. From the 2005 University of Queensland Law Revue. Man, I´m fired up!!! Aaaaarrghhhh! Linkage. Yippee!!!! Ben is in the nationateammmmmmm! Hoosier power!!!!!!!!!!!! Caldwell is also on the list! Gulf Coast High, represent!!!! So is Andrea Hupman, yeahh, Wildcatsssss! Roarrrrrrrr!!!! Sundsvallssimmare på väg till OS i Shanghai. Erik Dorch slutar och satsar till civil karriär. 15 miles of swimming across Long Island Sound is once again. well craig… i hesitate to call it plagiarism… but you are about a year late with this gem. how did you ever score an interview with Chen Lin? What it is? Telkom Short Course Championships take place at the GC Jollife Swimming Pool in Pietermaritzburg, KwaZulu-Natal, from September 29 to October 2. The heats will begin at 9.30am each day, with the quarterfinals, and latter stages taking place from 5.00pm from September 29-October 1, with the final day’s session of finals starting at 2.00pm. You are currently browsing the Uinnista weblog archives for September, 2007.